If you want a “go anywhere, do anything” type of camera, then the GoPro range does a pretty good job of covering all bases. The GoPro Hero 5 Black can still be bought for a reasonable price and has some great features like waterproof to 10m and a broad dynamic range. Being so superwide angle means that you can get some creative close-ups, as well as capture some huge scenic views in all their glory. The solid design of the GoPro range always gives confidence to take this unit where other video cameras and DSLRs fear to tread. The Hero 5 Black has the best features from previous models, along with some new thrown into the mix. 4k video at 30fps, 12MP photos, touchscreen, waterproof, enhanced audio and electronic image stabilization means that this unit is definitely a do-it-all action cam. The very tactile, rubber exterior is an upgrade from previous models and feels more rounded off in the corners. The Hero 5 Black is a few millimeters larger than its predecessors, so take this into consideration if you have accessories from older models. The rubberized outer shell also has a side benefit giving some extra shock proofing, along with peace of mind that if you drop this thing on the odd occasion it will have some extra protection. You now have a 2-inch touchscreen display and a protruding lens, along with 10m waterproofing. Previously, you had to buy an additional housing to venture into the water. The Hero 5 Black is happy down to 10m, but any deeper you will have to buy an additional waterproof case. As the unit is now fully waterproofed, the connection port cover such as the battery and microSD have better sealing. 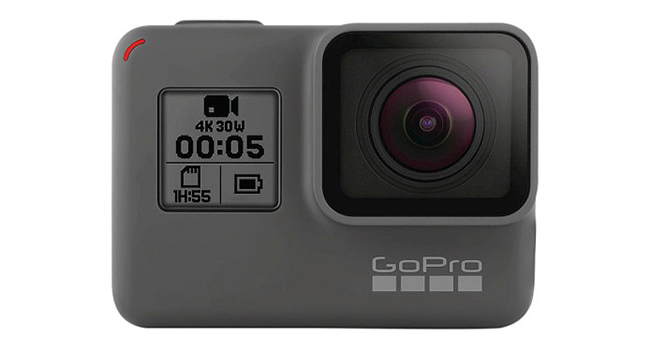 As a waterproof case has been done away with, which was the usual way of mounting a GoPro, you now use a plastic frame, which snugly fits around the camera case with a standard GoPro mount. The framework allows easy access to all of the ports such as the USB port for easy charging. It feels solid enough for more scenarios, but if you want some extra peace of mind you could buy an additional housing, which can also double as deepwater protection. You get dual microphones on the front and back, which can be used depending on your situation. If you’re traveling at speed and you want to cut down on wind noise you can swap to the rear microphone. Charging can be done through the USB-C port, meaning that you can take a portable smartphone charger or battery pack to power the Hero. Convenience and quality is the name of the game here. Boasting 4K at 30fps and images at 12MP, footage is ultra sharp and should satisfy for most applications. Video can also be shot in super slow Mo at 1080p at 120fps and stills in single, burst or time-lapse with the option of being saved in raw files. GoPro’s HDR format WDR (Wide Dynamic Range) gives another string to your bow for great quality images and further post-editing. If you’re GoPro is susceptible to getting scratches on the lens cover, then there is now a removable cover with a range of filters available for different shooting scenarios such as underwater. Although simplistic on the outside, the Hero 5 black has loads of functionality. Entering the ProTune settings allows you to change the exposure, ISO, sharpness and Ev compensation. There’s also spot metering which works very well for adjusting exposure. For video, you have the choice of different resolutions, along with frame rates. Electronic Image Stabilization definitely helps with smoothing out the footage and is definitely a wonderful edition for making your videos that bit more professional. One of the biggest gripes with the Hero 5 Black is the touchscreen responsiveness. You find yourself tapping a few times to get to the menu item you want, which can be frustrating when you’re working at speed. There have been some firmware updates and newer models address this issue, but it can be frustrating at times, especially when the unit is wet. In many ways, this is the only downside to the unit’s functionality. Luckily, GoPro has added voice control so you can shout orders at the unit to start recording or take stills, which can be a very helpful feature. The exterior has one large red button, which is used to power up the camera and start recording. Once all your settings are in place in camera, the Hero 5 Black is off and running almost instantly. the front of the unit has a small LED screen which displays the various capture modes such as video, photo, battery, and memory level. The 2-inch touchscreen is great for doing a quick review of your footage and although 2 inches isn’t very big, the screen is still sharp enough to see the quality of your footage either live or post. It’s possible to tether the Hero 5 to a smartphone and use the capture app, especially for downloading files, but for composing shots the screen works great. Speaking of supplied apps, you have Quik and Splice which can be used for editing. They may not have all the features of something like Adobe Premiere, but the idea is to get quick, quality results, fine for most applications. GoPro has done a fine job with its apps, allowing easy transfer of video and images to your smartphone. QuikStories is also a great added feature, along with other updates brought on a regular basis. The Hero 5’s closest competitor would be the Garmin Virb XE. As you can see, the Hero 5 is the clear winner if you’re comparing the two. When it comes to a take anywhere, action cam you really can’t go wrong with a GoPro. The Hero 5 Black has built on previous models, still being simple enough to use while being packed with features. Video and stills are better than before, with the addition of RAW files and Wide Dynamic Range means stills have tons of editing potential. The touchscreen can be a bit unresponsive at times, but this is really the only downside with a battery that should last longer then it does. Although the rubber covering should mean you don’t need a case, it may be worth buying one especially if you take this further than 10m of water. For such a compact unit that shoots fantastic quality video and at a reasonable price, you really can’t go wrong with the Hero 5. There are now newer units on the market, but that means you can still pick up a Hero 5 for reasonable money and still get fantastic quality footage. Previous Post« Previous Canon EOS Rebel T6i: Better Than Before?